For centuries longer [than the US] entire nations have depended on their wild seafood resources while their cultures have developed to reflect its importance nutritionally and culturally. Wild coho salmon remains an abundant wild salmon of the North Pacific and European markets enjoy its considerably lower cost compared to sockeye and king salmons. One of the reasons why coho is less likely to appear in American grocery store fish counters or freezers is because many Americans are less familiar with coho than other wild salmon species. Another reason may be volume. Because volume matters most when selling wholesale food commodities managed annually by way of seasonal harvest guidelines and regulations, US processors of wild salmon routinely prioritize their sales according to the size of the market; price is a secondary priority for perishable seafood commodities with annually strong harvests. Western European buyers seem to prefer wild to farm raised salmon in response to consumer demand for superior quality. In Southeast Alaska, 2017 Coho harvest remains open through September 15th. The price is higher this year than last year but remains lower than sockeye and king salmon. Coho abundance is strong and coho is a rich delicious wild salmon comparable to king salmon in size, color and omega-3 fatty acids. 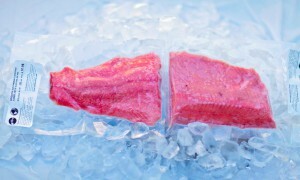 Some US grocery retailers are adding wild coho salmon to their available seafood selection. Otolith sources wild coho salmon and delivers our superior quality sushi-grade, low impact harvest portions throughout PA, NYC, NJ and DE. For a better source of omega-3’s than sockeye and a better price than king salmon, call or email Otolith Sustainable Seafood to increase your access to superior wild coho salmon.